I thought I’d just update you on some of the day to day happenings in our household at the moment. The triplets are practically big kids now. They often eat vegemite sandwiches for lunch. We have a very cute dragon living with us. J Boy has loved playing soccer this season. Even though he is pretty well clueless about the rules of the game and spends a great deal of his time falling to the ground and rolling around the field. (We’re working on getting him to stay on his feet for an entire game. It’s harder than you may think.) It seems like he’s just starting to get the hang of it though. Which is a shame, because it’s the last game of the season on Saturday. The triplets have now become a tourist destination. We had a Japanese exchange student, Genki, who is staying with a family in town come to visit us for a morning. He was a great young guy who fitted in with the family happenings for the day. He played with the babies and built a train track for T-Star, who adored him for it and re-named him as “Donkey”. The babies had to be quarantined into the porta-cot to keep the track safe from imminent destruction. I let Genki feed the triplets, and he did a great job. It can get a bit crazy. When Miss Rachael asked if he wanted her to take over he jumped up so quickly that I thought there had been an ejector seat installed in our chair. I think he did enjoy the experience though! We took a photo with the trio and Genki, but they decided to get grumpy (something about it being lunchtime) so they had to be bribed and are photographed with arrowroot biscuits! Alex had a lovely Father’s Day. So proud of my amazing husband who is now father of 5. We really tried to spoil Daddy, with everything from a power tool (chosen for Dad by J Boy), basket ball (chosen by T-Star) to homemade works of art. For lunch we had takeaway fish and chips in the park with my brother-in-law and his family. We make a jolly little party with the four adults and ten kids! We’re quite the rent-a-crowd these days! 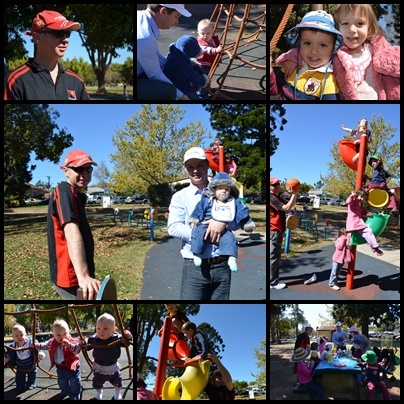 The kids loved playing with their Daddies. The triplets couldn’t believe the freedom of being in the great outdoors. Poor little things, don’t get out much. Hopefully they will a bit more now it’s Spring. The big kids especially hung out on a plastic thingy that you were chucked balls through. I don’t think that it is supposed to be used as a climbing frame, but the kids thought it was brilliant. Until J Boy got stuck in one of the tubes. Luckily Daddy came to the rescue. That’s why Dad’s are heroes. Once we got home Daddy had a chance to play with his new toy. I think he liked that. I happen to know that Genki / Donkey had a wonderful time with your lovely kids. He told us lots of stories about his experiences when he got home. Mind you, he was not sure about how he would cope if he had triplets of his own. But whatever he learnt on that day was taught by a master! The pleasure was ours, it’s always fun to have international guests in our home. Hope he has some good stories to tell, and hey, if he ever has triplets, I’m sure he’ll remember his couple of hours crash course! Hi Danni, I hope you have a lovely day on Sunday celebrating with your man. Well, I think I hope, or should I be hoping your baby has arrived by then? I know that you really get tired of waiting for bub to arrive by the end! Great stories here Caitlin! 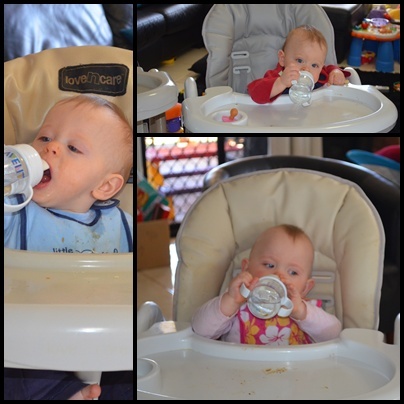 Must be nice for you that the triplets are now able to have vegemite sandwiches and not just spoon fed mush!! Nothing unusual or different happening in these parts apart from our youngest now deciding afternoon naps are not the coolest way to be spending his time when he can watch Thomas on tv!!! We had a real treat of a Fathers Day and went to Preston Peak Winery for lunch which was wonderful! 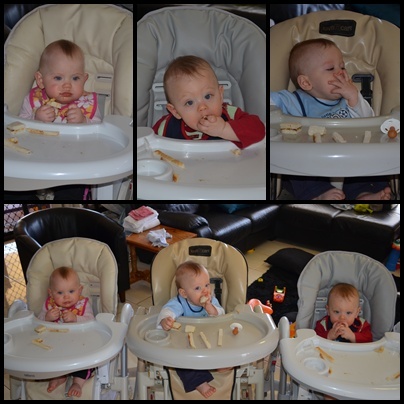 It is nice while the babies are eating by themselves. But then they finish, and there is mess everywhere, and I wish I was feeding them mush. It’s always a hard thing when kiddo’s say goodbye to naps. T-Star has recently and the triplets are trying to sleep only once a day. I am trying my utmost to make sure this does not happen. Nap time is so useful for getting things done in, right. Love Preston Peak. I’m sure you had a great time there. Glad you enjoyed a great family day. And don’t worry about the triplets not getting out much. Yesterday I told my book loving two-year-old about a place where you can go to read stories AND take them home. Her little eyes nearly popped out of her head at the thought of such a magical place. And that was a wake-up call for Mummy to stop working so much! Oh Peter is quite the catch. I reckon he deserves those brownie points. Enjoy your trip to the library, which truly is a magical place! awwww – such sweet photos! I laughed when I read the soccer part. I remembered my oldest son when he was about 4 or 5 years old. He was on a soccer little league team and he had no idea what he was supposed to so. All he did was run wherever everyone else was running and try to kick the legs of the other players. And that is awesome about having the exchange student over for the day. I love exchange student opportunities. We had one from Germany one summer, and of course my daughter went to Spain also as an exchange student. It is such a fabulous way for our young people to learn other cultures. And your babies and their big brother, are precious! Hey thanks Deb. Exchange students are great to learn about other cultures. Although having your children get married and go and live in other cultures, that concept I would take some time getting used to! I suppose I could come to terms with it for the sake of true love!